Penn State grand jury report released after frat hazing death of Timothy Piazza. Watch this report from Action News at 12:30pm on December 15, 2017. BELLEFONTE, Pa. (WPVI) -- A grand jury's report in the wake of a fraternity pledge's drinking death said Friday that Penn State officials displayed "a shocking apathy" to dangers from excessive drinking and that its inaction allowed criminal acts to occur. Penn State strongly objected to that characterization in a 144-page report released by a district attorney in Pennsylvania, saying it made extraordinary efforts to combat drinking and hazing. 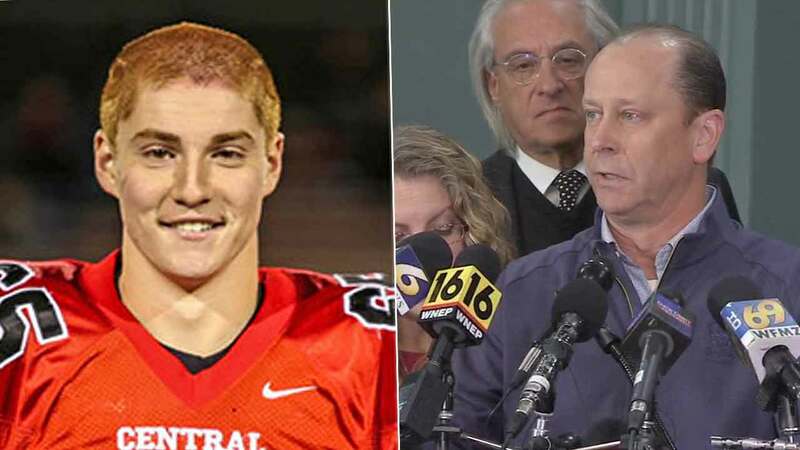 The report recommends a series of changes that the school should undertake in the wake of the death of 19-year-old Tim Piazza in February. It pointed to numerous assaults, injuries or alcohol-related emergencies in the last several years involving fraternities, and said it is unreasonable for Penn State to disavow all accountability for its failure to reform the fraternity system. Centre County District Attorney Stacy Parks Miller said the grand jury found that Penn State officials knew enough about the abuse of drinking and hazing in the fraternity system to have been more proactive to stop it. "They found that they knew a great deal of it, and that they should know the rest. If they didn't know, it was a deliberate, like, 'don't want to know,'" Parks Miller said at a news conference. As far back as 2009, Penn State officials were "remarkably undisturbed" by allegations of heavy alcohol consumption at one particular fraternity and showed a "shocking apathy to the potential danger associated with doing nothing." In a 70-page response to the report submitted to the judge, Penn State said it has aggressively promoted safety and accountability in the fraternity system, in 2009 and before that, and should not be criticized for not doing more. However, Penn State said its efforts are limited by the unwillingness of national fraternities, their associations, undergraduate members and alumni "to challenge behavior that has been accepted for years across the nation" and accept major change. It said parents have at times aided fraternity efforts to violate school rules and state laws over underage drinking. State hazing and underage drinking laws are weak, Penn State said, and contended that the grand jury had struggled to provide a single recommendation to help the university fight dangerous student drinking and hazing. Parks Miller called Penn State's response to the report "defensive and somewhat demeaning." Penn State permanently banned Beta Theta Pi in March, saying its investigation after Piazza's death found a persistent pattern of excessive and forced drinking, hazing and drug use and sales. Piazza's death occurred two days after he suffered a series of falls and consumed a dangerous amount of alcohol during a pledge bid night. Another 12 students have been charged in the hazing death of Penn State fraternity pledge Timothy Piazza. Nationally, the deaths of at least four fraternity pledges this year have helped fuel a re-examination of Greek life at some colleges. The report calls on state lawmakers to pass stronger laws to deter hazing and underage drinking. It also calls on Penn State to regulate drinking itself, rather than make a fraternity council responsible, and for the university to expel students involved in hazing after they are "afforded full due process rights." "Anything less will fail to operate as a truly effective deterrent," the report said. The fraternity council's system of monitoring fraternity parties employs a private security firm that is unable to stop dangerous behavior. Parks Miller called them "glorified baby-sitters" and the grand jury said the guards' testimony "paints the picture of a brazen Greek community who freely flout (fraternity council) regulations and criminal laws without any fear of reprisal." When the fraternity council received reports of violations, it controlled whether to pass the information on to Penn State, and what sort of penalties to mete out, the grand jury said. Penn State said it has taken over the primary role in monitoring and disciplining fraternities for alcohol-related violations, hazing, sexual assault and disruptive social gatherings. If it finds that a chapter jeopardized a student by hazing, the school will permanently revoke its recognition, it said. Penn State said it has revoked recognition of 13 fraternity and sorority chapters in the past two years, or one in six. After Piazza's death, Penn State imposed an immediate ban on alcohol and social functions at fraternities. A police lieutenant told the grand jury that, during the crackdown, the St. Patrick's Day holiday was quiet and without the usual reports of public urination, blowout parties and public disturbances.